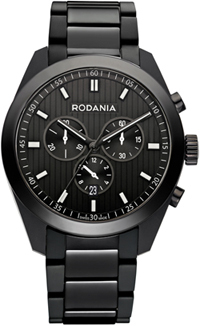 Baselworld 2012: Rodania - LS1.The Swiss company Rodania was founded in 1930 in Grenchen. The Swiss company Rodania was founded in 1930 in Grenchen. After 17 years of distribution centers were opened in Caracas, London, Montreal, Brussels and New York. All brand watches are made using modern equipment with the use of manual work. This allows you to control the level of build quality at various stages of production. Watch company Rodania produces quartz and mechanical chronographs, both male and female. Collections “Cazius”, “Mothus”, “Themis”, “Altro”, “Celso”, “Jadis”, “Nelson”, “Evolution”, “Maura”, “Adelis”, “Salina”, released a brand Rodania, enjoy huge success with fans of Swiss watches. New factory called LS1 is a combination of classic and modern. Black elegant housing made of high-tech ceramics, sandblasted. Case diameter is 44 mm. Wrist watches for men LS1 equipped with reliable and accurate quartz movement Ronda 5030.D. On the black dial are three counters: the counter at 12 o’clock, date and 30-minute counter. A small second hand is in position “3:00”, 12-hour counter – to “6:00”, a 30-minute counter – to “9:00.” Date window located at the position of “6:00.” Black arrows with white stripes covered with luminescent material. Dial protects the sapphire crystal. Waterproof men’s watches LS1 is 100 meters. Chronographs are supplied with a black stainless steel bracelet with folding clasp. Buy Swiss Watches LS1 can have official representatives of the company Rodania.